There are two 7 inch singles that were released on Susstones Records.... "She�s Tara" b/w "Psychedelic Kingbee" and "Alias Lovely" b/w "In The Corner of Your Room" with a different recording of the a-side track. There�s one 7 inch single that was released after the CD... "Billy The Monster" b/w "Black & White Days" featuring a demented cover of the Deviants� song on the A- side! They were friends with Plasticland but never gigged with them. They did play a show with Fabulon Triptometer, though, and many with John Frankovic�s The Gothics. The Romulans, to me, were the heirs-in-waiting to the harder rockin'psychedelic side of the mighty Plasticland; especially so on tracks like "Bug Love" and "Suspicious." Rather surprised no one has made this connection before...comes off like a long-lost Plasticland LP. Too bad they didn�t make another record. Our loss. I think it�s complex, haunting, and enjoyable, with some cuts here and there being a little out there or just too noise related, then again, there are not many musicians who can create material as well as these guys can. I don�t know...Well, you haven�t really captured it, 'cause they sound like no one else. 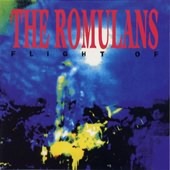 THE ROMULANS ROCK! Truly psycho rockin� band. Can�t believe they're from US, they sound like the old psyche hardrockin� english band, don�t ya think so? But it�s pretty good 4 me. This is one point, which is a big plus for The Romulans, they manage to induce their own note into this not really originality-oozing genre and don�t pay this with strange sounding compositions or a wild mixture of styles. That�s all what I wanted to say lol. Led Zeppelin meets Yes! Pretty good songs, especially "Paisley Farm" and " The Doctor" (my faves)! Jeez, it�s just one of the greatest records I�ve ever heard. Excellent stuff with many good melodies. Heavy psychedelic rock, with a few nods to 60�s mod! If this is your thing you should love this cd if you can find it.